Members of the SCAPTA Executive Committee met in Greenville on Oct. 13 to discuss the draft 2018 budget and other items. On Oct. 14, members of the Executive Committee, committee and district chairs and a few other honored guests worked with our facilitator, Dianne Jewell, to review and revise the current SCAPTA strategic plan. Results and comments from the strategic planning survey that was sent to members and nonmembers were considered during these discussions. The three goal pillars over the next 3-5 years will focus on Advocacy, Education and Practice areas. Please plan to join us for our next Upstate District SCAPTA meeting. Time: Dinner will be served at 6:45 pm and the meeting will begin at 7:00 pm. Dinner will be served. To help our sponsor prepare, please RSVP to holly@ssi-physicaltherapy.com or Trudy_messer@bshsi.org by Thursday, November 9th at 5pm. SCAPTA members will receive a free CEU. We encourage non-members to attend, however, there will be a $10 charge. SCAPTA Facility of the Year award nominations have been narrowed down to five clinics. Thank you to all of the facilities that took the time to submit an application. It shows your enthusiasm and adoration for your clinic! Throughout October is National Physical Therapy Month, SCAPTA will highlight the top choices through this newsletter and on social media. Today's highlight is Made 2 Move Physical Therapy in Charleston. 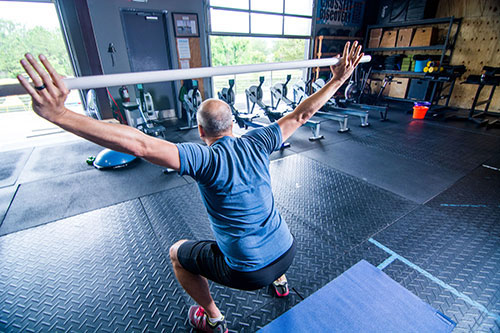 This is a unique physical therapy clinic that is based out of a CrossFit gym. We give Yves Gege, owner and physical therapist, a special shout out for helping with the SCAPTA commercial that launched this year! Mark your calendars for Wednesday, Feb. 7, for our PT Day in Columbia. Details will follow. This webinar is scheduled for 8-9 p.m. (EST), Nov. 6.